It was a snowy Saturday in January and people were trying to avoid the fluffy precipitation. However, I was heading west where it would snow sooner for my chance to see polar bears in the snow. My destination was the Columbus Zoo & Aquarium in Powell, Ohio. 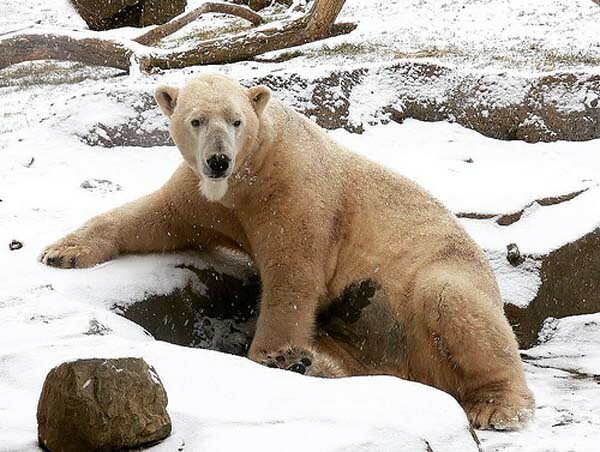 The zoo recently got a new male polar bear named Lee from the Denver Zoo. The zoo’s former male, Nanuq, died in April 2017, a few months after his last offspring were born. He was an older bear and had geriatric related issues that contributed to his death. An interesting fact about Nanuq is that he spent most of his life on concrete in zoos before coming to the Columbus Zoo & Aquarium during his “retirement” years. He embraced the opportunity to roll around in grass and natural substances and his caregivers soon discovered he was allergic to it! He was given a pill each day for his allergies. Back to this trip with the three polar bears, Lee, Anana, and Aurora. Anana and Aurora are twins and they were separated for about a year and a half when each sister was raising their offspring. 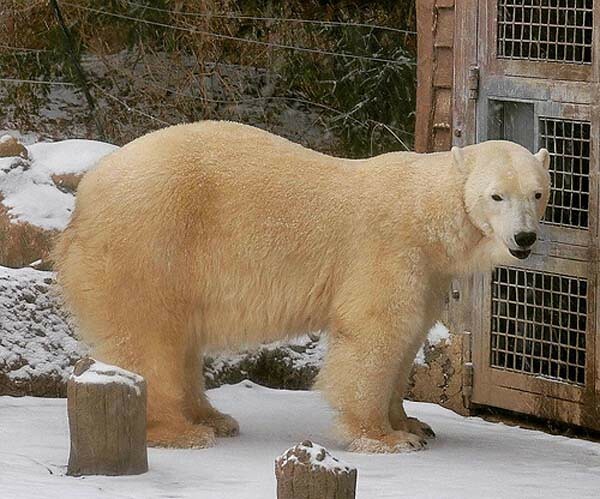 Since females in the wild do not raise their offspring with other polar bears around, the zoo kept them separated. The two sisters had a few weeks to reunite and play with each other when their offspring were sent off to other zoos. Then Lee was introduced to the females and he changed things up. Lee took a liking to Anana and she began to tolerate him as well. 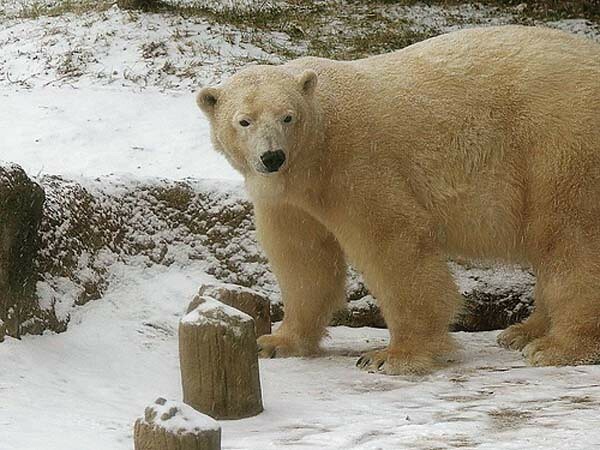 Aurora was more cautious, a trait that her caregivers noticed about her when introduced to new male polar bears. When Nanuq was introduced to the females, he took a liking to Anana too initially, but eventually all three bears were smitten with each other. Right now, Aurora keeps her distance from Lee. Lee does not seem to mind to keep his attention on one female, something he was used to at his former home, the Denver Zoo. Lee also makes sure the females are kept separated. Anytime Aurora is brave enough to attempt to have contact with her sister, Lee will chase her away. During my visit, there was only one time the two sisters got to each other and were allowed to play for five seconds. It will be interesting to see in the next couple of months when Aurora’s hormones kick in if she will tolerate Lee more and if he will start to be smitten with her as well. As for now, Lee follows Anana around like a puppy dog. Sometimes she tries to run away from him, but eventually you will see the two being affectionate towards each other. At the end of my visit, they were rolling around and playing with each other in the snow. 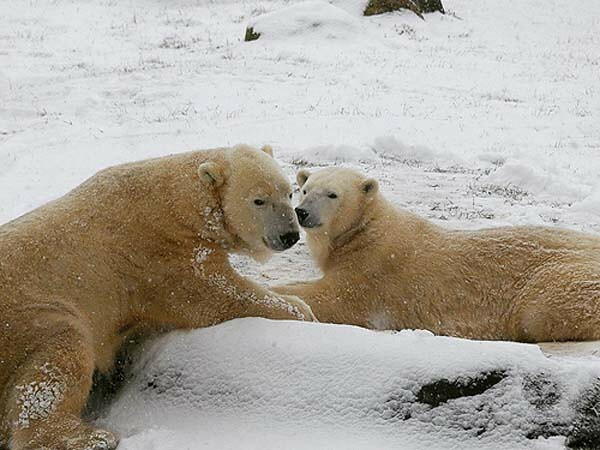 I was told by one of the polar bears’ caregivers that these adult polar bears don’t seem to react that much to snow. Maybe it was because the snow kept falling down that day, but I saw all three polar bears sliding their bellies on it and having the time of their lives. Aurora and Anana are proven breeders, but Lee has not sired any cubs yet. It will be interesting to see in the next couple of birthing seasons if the new combination of bears has luck. Anana and Lee are already off to a good start! Es ist immer interessant, andere Eisbaeren kennenzuletnen. Die Anlage ist sehr schön und ur Eisbären sehen gut aus. Danke fürs Zeigen und die schönen Bilder. Den Eisbär-Mann Lee kannte ich bis jetzt noch nicht. den Damen zu verstehen, zumindest mit Anana. Thank you for the report from the Columbus Zoo. It looks like Lee make the life of the sisters not easy. It is great that Anana likes him. I hope Aurora will be happy with Lee too. 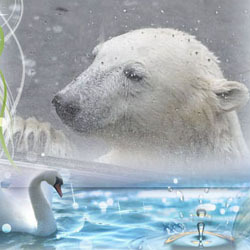 It was such a great pleasure for me to publish your excellent report from the Columbus Zoo. Last week we could meet Amelia Gray and Neva in this magazine and now even their mothers Anana and Aurora – and even their new male companion Lee. Lee is a handsome male who seems to be in love with Anana at the moment. Hopefully he and Aurora will soon get along better. All three bears look gorgeous! Thank you so much for this charming article! 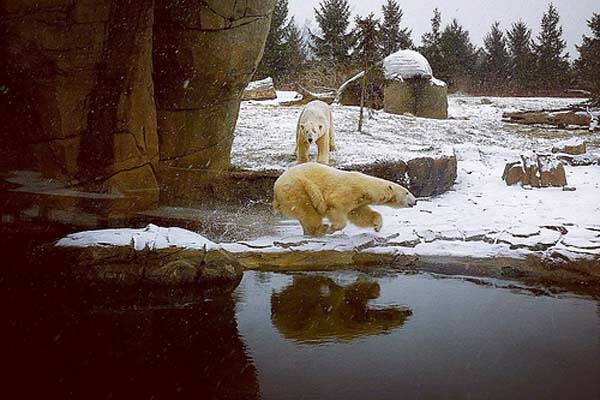 Thank you for this interesting, informative and vivid report about the polar bears in the Columbus Zoo and the fabulous pics. The new male Lee is a good-looking guy. His face reminds me of our dear Yoghi. It´s quite understandable that Anana fell in love with him immediately. The last photo is heartwarming. I´m optimistic that even pretty Aurora will find out that he is more attractive than scaring. Hopefully in the nearer future all three bears will cope with their togetherness and live in harmony. Thank you for this really detailed report about the Polar Bears in the Columbus Zoo. It is interesting to see how the two girls cope differently with Lee. He seems a nice bear, so Aurora may well change her mind. danke für die schönen Bilder von den Eisbären in Denver. Das scheint wirklich eine schöne weitläufige Anlage zu sein. Log in | 53 queries. 0.765 seconds.